Staying cool is serious business. There are many options for cooling your home, but those options aren’t available to everyone – especially renters and dorm-dwellers. When you can’t get central A/C and a pedestal fan is just not cutting it, portable air conditioners are a welcome alternative. Is portable A/C right for you? We’ve prepared answers to six frequently asked questions to help you decide. As the name implies, portable air conditioners are free-standing cooling systems that move from room-to-room with ease. They work by pulling in warm, damp air and returning crisp, cool air into the room. The unit then vents the warm air outside. A portable A/C is small but powerful, and packed with features to help you stay cool with ease. Why Choose a Portable Air Conditioner Over a Window Unit? The main draw is versatility. You can use a portable air conditioner in just about any room with a window, and they’re great for spot cooling in rooms that lack proper ventilation. When you move from one room to the next, you can easily roll the unit along the floor and bring it with you. They’re also more affordable and easier to install than window units. How Do I Install a Portable Air Conditioner? All you need to install a portable A/C is a window and an electrical outlet. Portable air conditioners come with an expandable window unit that can adjust to fit vertical or horizontal windows. In most cases, you don’t even have to remove the window screen – simply slide to adjust the unit, place it in the window, and attach the hose. You can then plug in your air conditioner and start cooling! 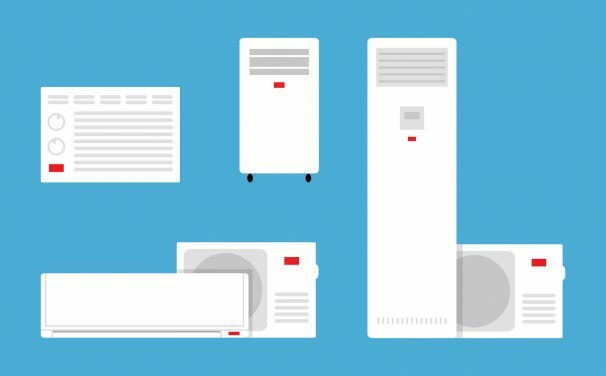 What Maintenance is Involved in a Portable Air Conditioner? While a portable A/C does require some general maintenance, it takes little effort on your part. In addition to cooling the air, portable air conditioners dehumidify the air by removing humidity. Some models can evaporate this moisture on their own, while others collect it in a leak-proof compartment that you periodically empty. A warning light will let you know when the container is full, and the unit will shut off long before it overflows. Portable air conditioners also have an air filter that collects dust and dirt over time. The unit can’t run efficiently with a clogged filter. However, you can easily rinse the filter in the sink and replace it every few months. Portable air conditioners come in various shapes, sizes, finishes and colours. The ideal choice depends mainly on the size of the room you want to cool. You measure the power of a portable A/C in BTUs. The models start at 6,000 BTUs, while the most powerful units can reach up to 14,000. You can cool small areas, like bedrooms and garages, with under 10,000 BTUs. Larger areas, like offices and living rooms, take more. Are Portable Air Conditioners Energy Efficient? Yes! Danby’s portable air conditioners are highly energy efficient. If you’re trying to go green, a portable air conditioner can be a great way to reduce your energy emissions. By spot cooling the rooms you use most instead of cooling your entire home, you will consume far less energy overall. You can be even more energy efficient if you use the automatic programmable timer, keep the air filter clean, and turn on fan mode to save on electricity when it’s cool outside.